Ambiance is all that the name implies - a villa with a special atmosphere that will positively impact your entire vacation. The living spaces flow into one another, so there’s lots of room to mingle and lounge. The glass walls open completely to blend the outdoor and indoor living areas into one space, so you can easily keep an eye on all your guests. Ambiance Villa is a four-bedroom hillside home in Terres Basses. 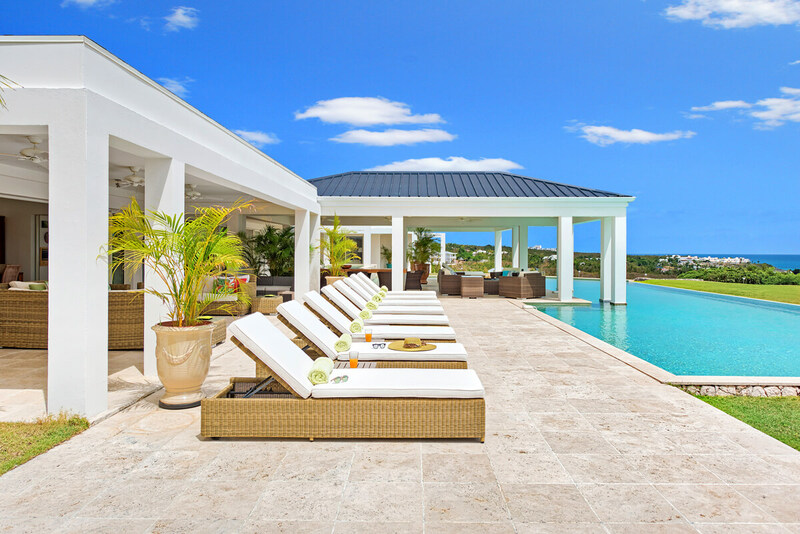 This villa combines sunset views and modern design for the ultimate special event venue or family vacation spot. The extravagant, palm-lined drive leads to a large garden courtyard that frames the sapphire sea and sky. The huge, contoured pool wraps around the veranda and the lawn, and a cozy al fresco dining area sits in the courtyard just off the bar. Ambiance’s ocean-facing exterior is lined with covered terraces and open sundecks, with dining and lounging throughout. A large BBQ station sits near the interior kitchen and dining space. Spacious interiors and panoramic views wait beyond the villa’s front door. The house is open, airy, and perfect for an extended family, weddings, or a company retreat. The overall design is sleek and elegant. The air-conditioned living room mixes natural elements and neutral tones, and its pocket doors disappear into the walls to enhance the ocean view. It’s furnished with a large plasma TV, a DVD player, and satellite. The interior dining room sits adjacent to the kitchen, which is divided into two rooms. Half the space is devoted to a modern chef’s kitchen with a flatscreen TV, and the other half has a coffee/cocktail bar with seating. All four of Ambiance’s king suites are equally sized and air-conditioned. Each suite has ocean views, a TV, a DVD player, seating, and a safe. Two suites are connected to each other, and the third suite has a small children’s room attached to it. The four ensuite bathrooms are decorated like spas, with travertine, stone, and wood accents. Ambiance is open to hosting special events, as long as the home’s maximum capacity isn’t exceeded overnight. Guests are responsible for post-event cleanup, and any catering company, private chef, or wedding planner must be approved by the owners. Although secluded, Ambience is close to amenities. It’s a short drive from Plum Bay Beach and Baie Nettle’s restaurants. The airport is five minutes away, and Marigot is 10 minutes away. The home is maintained by a housekeeper, gardener, and pool service.